New York covers 54,475 square miles (the 27th largest in the U.S.) has a population of 19,651,127 (2013), and is the third most populous state after California and Texas. New York was the 11th state to join the Union on July 26, 1788 and has been the Birthplace of four U.S. Presidents (Martin Van Buren, Millard Fillmore, Theodore Roosevelt and Franklin Delano Roosevelt). Schenectady , Albany, and New York City, once the major industrial cities of the lower Mohawk and the Hudson, are leading the way with manufacturing revival. Except in the mountain regions, the areas between cities are rich agriculturally. The Finger Lakes region has orchards producing apples, one of New York’s leading crops; vineyards here and on Long Island make the state famous for its wines. The state produces other, diverse crops, especially grapes, strawberries, cherries, pears, onions, and potatoes (grown especially on E Long Island); maple syrup is extracted, and New York is the third leading U.S. producer of dairy goods. 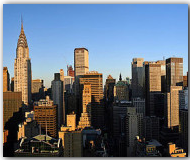 New York’s mineral resources include crushed stone, cement, salt, and zinc. The state has a complex system of railroads, air routes, and modern highways, notably the New York State Thruway. The New York State Barge Canal, an improvement of the old Erie Canal , is now being converted to completely recreational use; the Hudson and some other rivers still carry freight. Ocean shipping is handled by the port of New York City and, to a much lesser extent, by Buffalo. Hydroelectricity for New York is produced by the St. Lawrence power project and by the Niagara power project, which began producing in 1961.